Kitt peels her cucumbers, but I like to leave the skin on mine. However, you do want to lop off the ends of the cucumbers. In particular, cut off the blossom end. According to Marisa, there is an enzyme on the blossom end that makes pickles limp. So yeah, make sure you get rid of that. 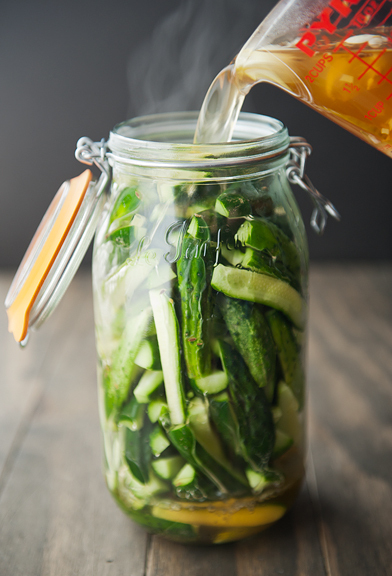 Pack the cucumbers into a large enough jar, pour the hot brine over them, and let them cool. Pop the pickles into the refrigerator and commence snacking. Having made this recipe a couple of times already (because they are THAT good), I don’t notice too much difference between the batch made with shallots and the batch made with the whites of green onions. The smaller pickling cucumbers are slightly crunchier than their larger brethren, but both still deliver a nice bite to sink your teeth into. The pickles are tangy, slightly sweet, with a touch of garlic, dill, and heat. Great alongside a hot dog, burger, sandwich, barbecue, or solo! 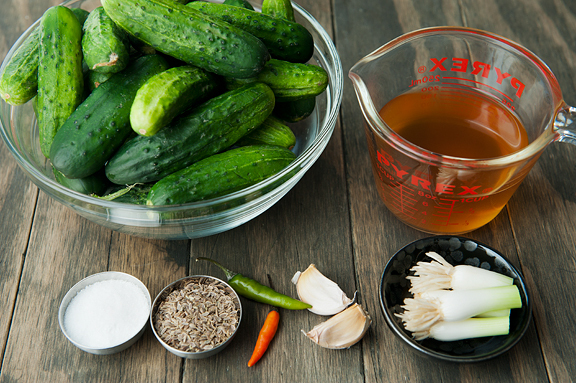 Note 1: Use pickling cucumbers, not those watery awful cucumbers you find in the grocery store. 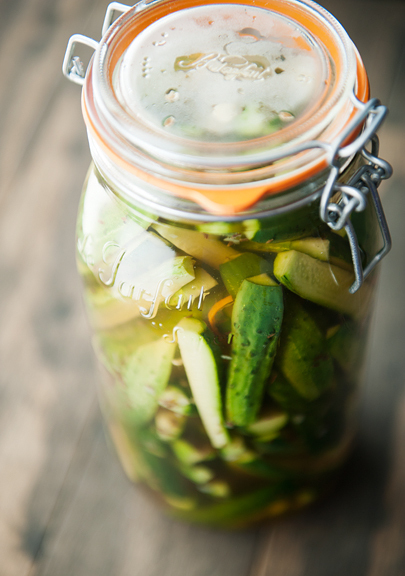 The smaller the pickling cucumber, the more crisp your pickle will be. 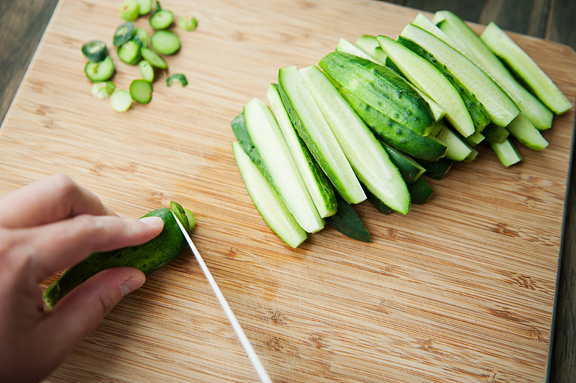 Note 2: Be sure to slice off the blossom end of the cucumber. Not sure which one that is? Slice both ends! The reason according to Marisa is that the blossom end contains an enzyme that leads to limp pickles – no one wants that! Note 3: Kitt peels her cucumbers, I do not. I prefer the skin on for more crunchy action. 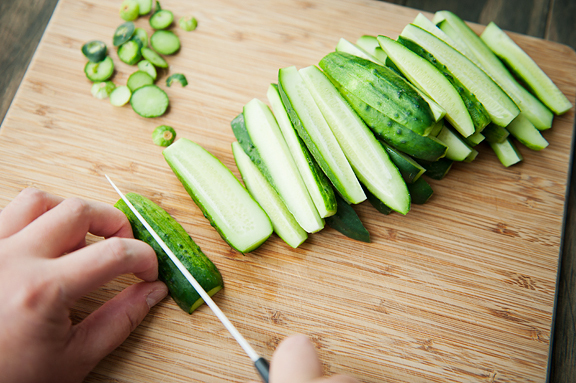 Wash the pickling cucumbers clean, then slice off the ends and cut lengthwise into quarters. Slice the chiles lengthwise. 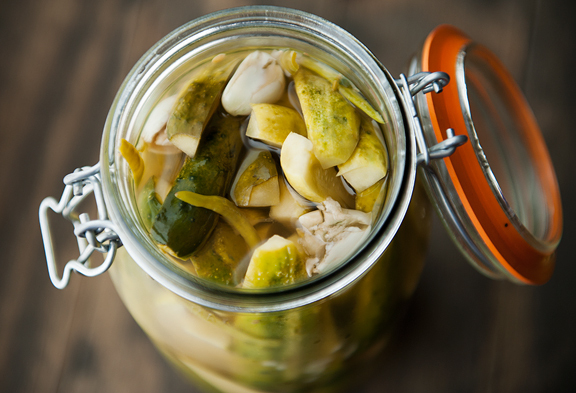 Pack the cucumbers and chiles into a 2-quart jar (or however you want to divvy it up). 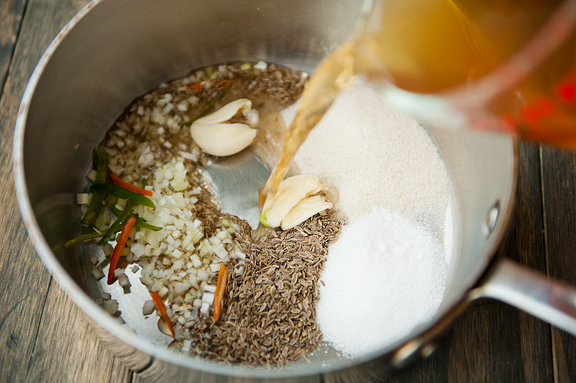 Place the water, vinegar, sugar, garlic, shallots (or onions), dill seed, and salt in a medium saucepan and bring to a boil. Let it simmer for a couple of minutes. Pour the brine over the cucumbers and peppers. Seal the jar(s) and let sit on the counter until completely cooled. Store in the refrigerator. Makes approximately 2 quarts. I love pickles too! We find German pickles here in RI from time to time…they are wonderful! I’m going to give this recipe a try. Thanks! 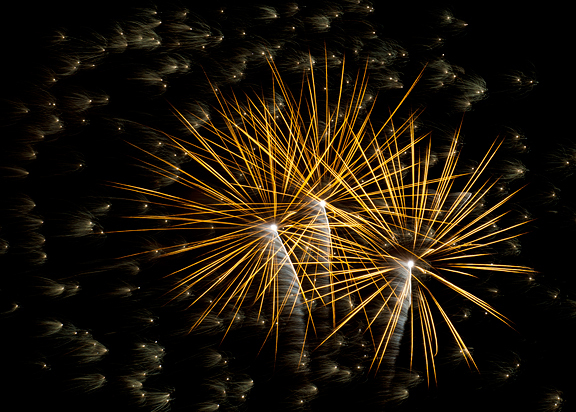 Those are the best firework photos I’ve ever seen. Wow! 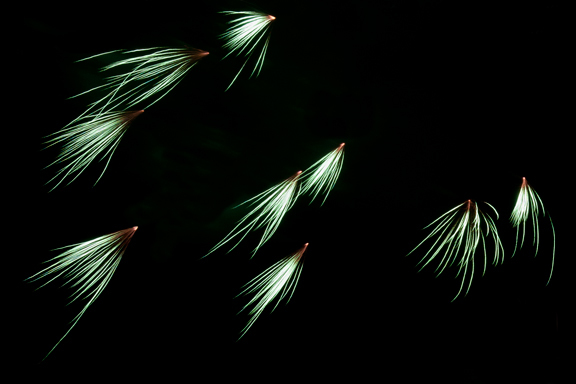 I think the fireworks could look like pine needles, but they also look like the dry flies that TPH makes for fishing. You make everything look so simple…I want to try these! LOVE a good pickle. I’m a pickle fiend, too! Looks like a great recipe, I will have to use it on my multitude of pickles. 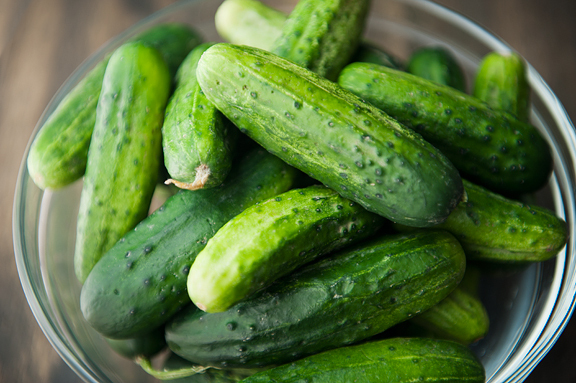 Did you know that the raw “cucumbers” you have pictured are technically pickles, not cucumbers? They are actually a totally different plant! My boyfriend’s uncle did his thesis for his Master’s of Ag on the difference between the two. 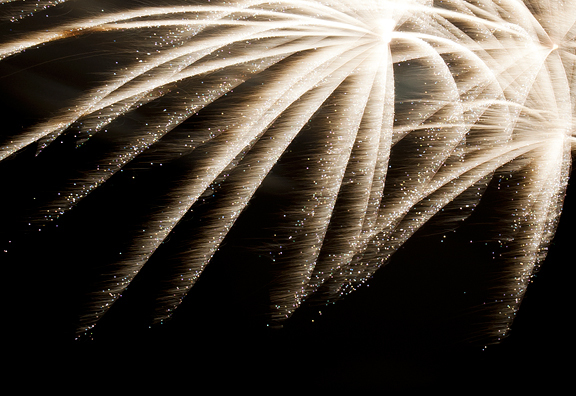 Your firework photos are beautiful, by the way! I can never get mine quite right. I never knew you could find porcini mushrooms in Colorado. I love your photos. 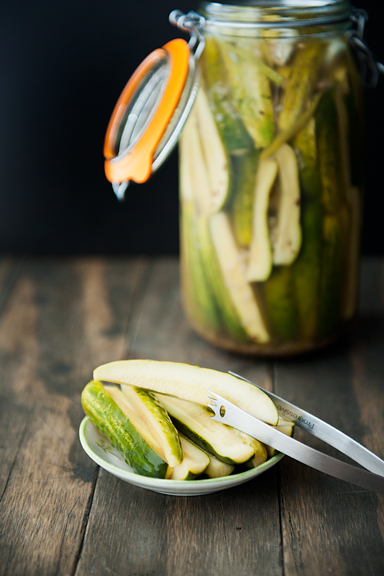 Although I have never made pickles, these look so easy I may give them a try. Since I am completely overwhelmed with cucumbers right now, this is quite welcomed!!! I just found a random cucumber in my garden the other day – and I happen to have all of the ingredients for this pickle. I know what I’ll be doing this afternoon! PS – your photos are AMAZING! I’ve NEVER been able to get fireworks pictures look so beautiful! PICKLES. I canned a batch a week or so ago, but I definitely need to make a refrigerator batch for the immediate snacking. Hooray! 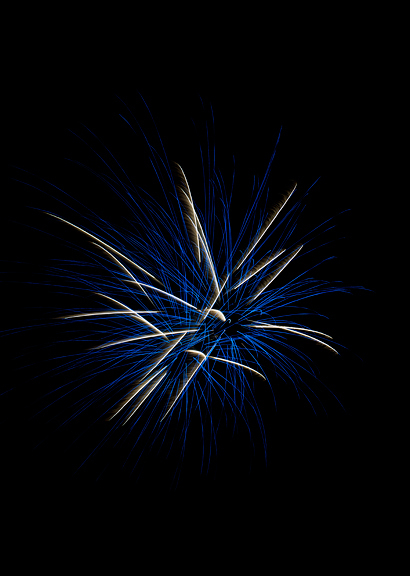 Love the fireworks. 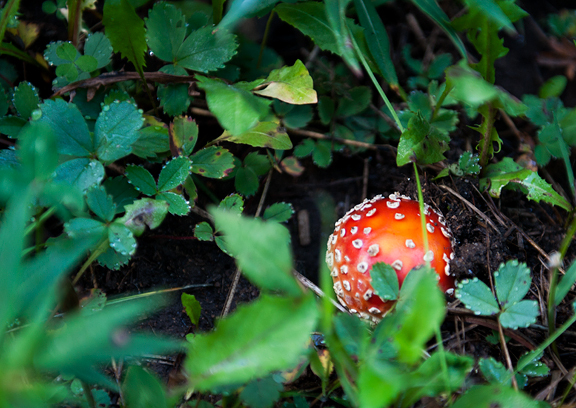 Love the 1UP mushroom. Love these pickles. I’m thinking I would add some fresh dill to bump up the dill factor. Oh boy, I was just thinking of making my usual refrigerator pickles, but realized I don’t have any rice wine vinegar on hand. Maybe I’ll try it with cider vinegar, which I have plenty of. Thanks for the recipe! Hooray! Heading over to check out the fireworks photos. We were out of the country on the 4th (and thank you, we LOVED our trip to France), so I am thrilled to get my fireworks fix, especially since your photos are often better than seeing them live! Thanks for sharing! Is the sugar necessary for preservation or just for taste? could you also add fresh dill to make it more dilly? A mushroom expert friend is a very valuable kind of friend to have! 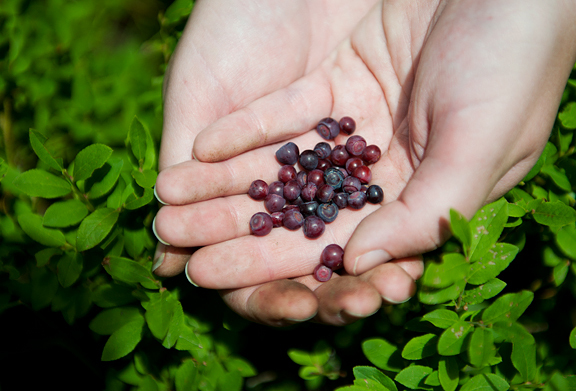 I love getting my search pattern trained to different things, from fossils to berries to birds. 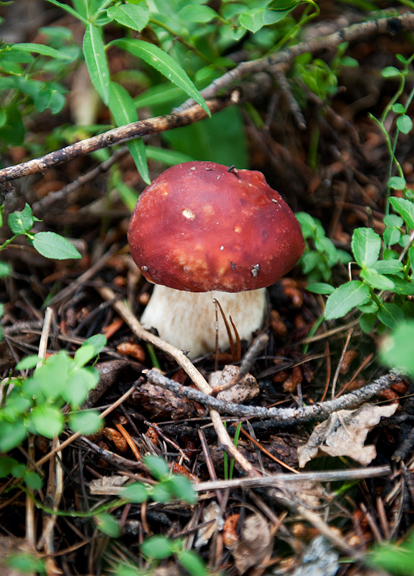 Haven’t looked for mushrooms in quite a while– don’t have that expert friend locally– and haven’t tried pickles. I should try this refrigerator kind, it’s hard to find a good natural pickle in the store and these look easy. The pickles look so good. My daughter could eat the whole batch. Abbe – these pickles are more kosher style with a little sweetness, but nothing like the sweet pickles. Rocky Mountain Woman – Color me jealous!! Diane – try it! I bet you’ll like it! Lauren – it’s just for taste, so you could reduce or remove. I think the vinegar is what preserves it (although these are refrigerator pickles…) And yes, like Brandon said, I think fresh dill would be lovely to add to it. Mary – these are SUPER easy! Joy – I don’t blame her! joey – yes, these are refrigerator varieties which I love because it’s so easy and quick! I made your pickles last night. The pickles are good, but the dilly ones I usually make for canning are slightly better. I think the sugar is putting me off a little. 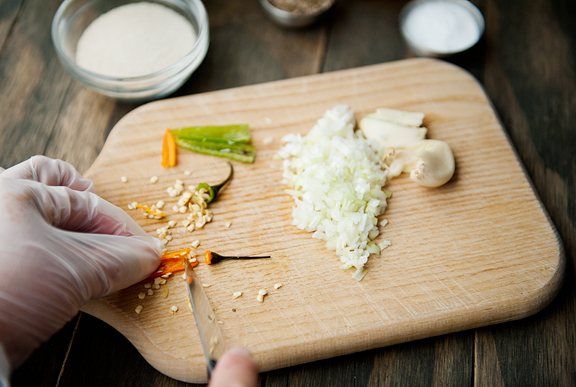 But the ease of preparation(instead of canning) is a HUGE plus. 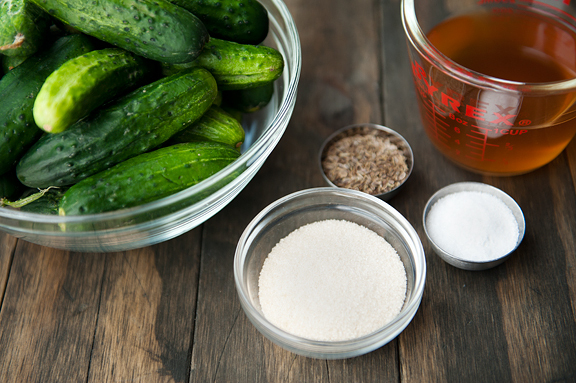 Do you think I can make these pickles without sugar next time? I remember my parents making pickles, and since I love them have always wanted to make my own but the whole canning thing scares me, so I love this recipe. I’m going to make these with my fellow pickle lover, my daughter. Thanks! Lori – I’d let them cool closed. Good luck!